These DIY Mason Jar Citronella Candles are easy to make and look stunning! So guess what, friends! We bought a house! After renting for the past 6 years we finally get to own our piece of suburbia again. To say I’m excited is the understatement of the year. There were a few things that I had to compromise on in the new house, one being a screened in porch. The house that we have lived in for the past 6 years has an amazing screened in porch where we have spent countless days relaxing and sipping on cold beverages. The best things about a screened-in porch? You can enjoy the weather without the nuisance of mosquitoes. Those suckers HURT. Our new house has a gorgeous patio with a pergola so I’m not really complaining here but I am going to need a way to keep the mosquitoes at bay this summer, especially since there is a small creek running through the back yard. So I’ve made these DIY mason jar citronella candles to solve that problem. You know what I HATE about regular citronella candles? The way they look. I’m not a big fan of a candle in a bucket. I wanted a prettier look. A look that would go great with our outdoor decor. 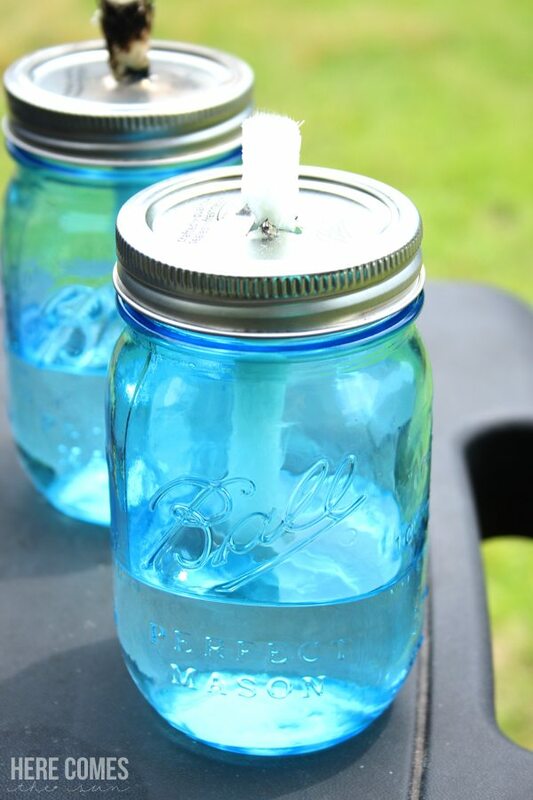 That’s why I decided to use blue mason jars for my citronella candles. You now have a pretty candle that also keeps the bugs away. And when the oil is gone, no need to buy a new candle, just refill it and add more essential oil! Let me just warn you that the flames on these are high because you are using torch fuel and not candle wax. That being said, I would recommend keeping an eye on these during your get-togethers to be sure that children do not get too close. Also, make sure you place them in an area where they can’t get knocked over. You don’t want fuel to spill out and catch other things on fire. I love using essential oils around my home and have been slowly trying to replace our cleaners with essential oils in an effort to reduce chemicals and go natural. Did you know that you can also use essential oils in food? If you are interested in purchasing essential oils or just want to know more about them, you can find more information on essential oils here or just shoot me an email. 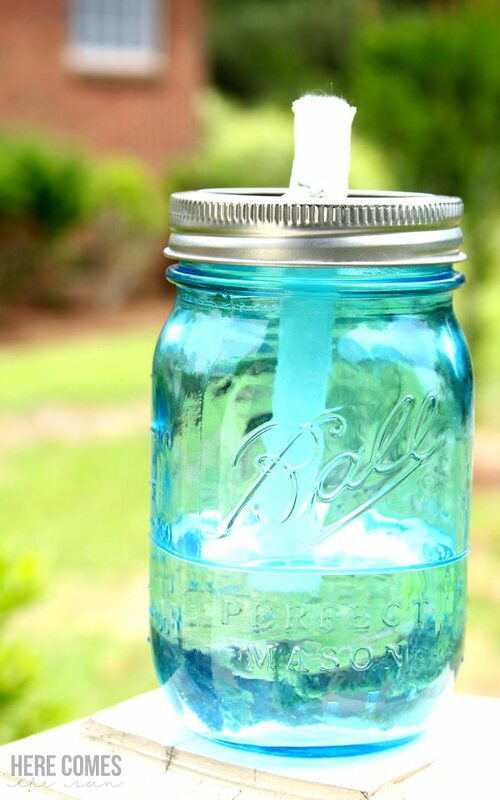 If you want more mason jar crafts, you’ll want to check out my DIY Solar Powered Mason Jar. Great idea. We planted a bunch of marigolds around our back porch and that seems to really have helped this year.